Motor yacht ‘Maiora’ 27 is a new 2006 yacht which is offering luxury crewed yacht charters in the Western Mediterranean. With accommodation for up to 9 guests she is the creation of the Italian Fipa yard and is made entirely of fiberglass with two decks plus a flying bridge. 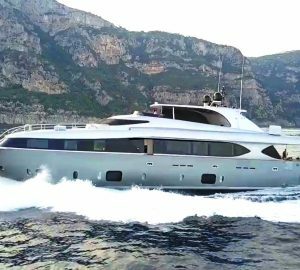 Motor yacht ‘Maiora’ 27 has a saloon furnished with a C-shaped sofa, table and another sofa, dining area for eight people, separate large galley and modern command bridge complete with all the necessary instrumentation for long cruises. Outside her main deck she provides a dining area in the cockpit from which two elegant stairways on either side of the transom lead to the spacious bridge. The bow area of the deckhouse has a cushioned sundeck covering access to the tender storage area located athwartships. A davit is provided for maneuvering the yachts tender. One the flying bridge is an outside command station. 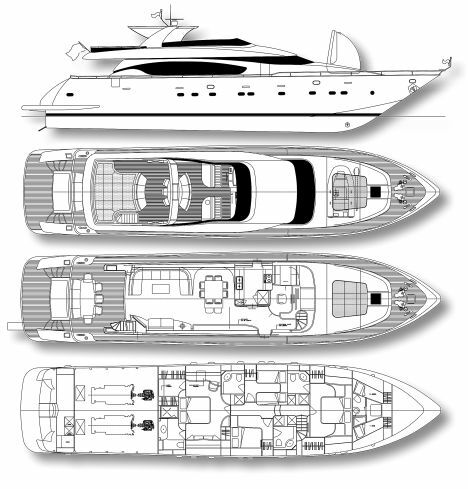 In the centre of this deck there is a zone for relaxation, while astern there is a roomy sundeck area. Motor yacht ‘Maiora’ includes the following accommodation for up to 9 while on charter. She has an owner’s full beam master suite located amidships where there is centrally placed double bed, a corner for relaxing, an office corner, dressing room and private bathroom. She has a full beam VIP suite and there are two guest cabins, one with queen size bed to starboard and one with twin beds to port and a Pullman bunk. Each guest cabin has its own en full suite bathroom. Crew quarters are separate. Motor yacht ‘Maiora’ water toys are TBA.